Most American citizens value the mindset and handiness of do-it-yourselfers. Rolling up your sleeves and getting the job done is useful for gaining independence while also saving some cash. Building insulation, however, is one service that requires professional help. Another issue comes when companies hire inexperienced, untrained insulation contractors to get the job done. When your business requires quality fiberglass insulation services, be sure to reach out to AZ Drywall Finishing for assistance! Our drywallers and insulation contractors in Chicago strive to deliver the best services and products in the industry, providing excellent satisfaction to exceed our customer’s expectations. We believe in delivering the best insulation services possible to ensure that no shortcomings come back to negatively affect your business. 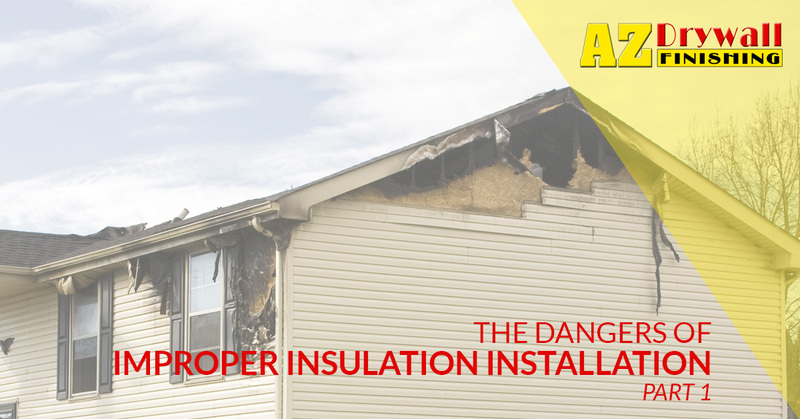 Today, we’ll begin to look at a few dangers that can present themselves when the insulation in your structure is installed improperly. If you’re in need of building insulation in Chicago, be sure to reach out to AZ Drywall Finishing today! One of the biggest and most apparent problems you’ll be dealing with if your insulation is installed improperly is moisture infiltration. The vapor barrier on the back of fiberglass insulation is essential, and oftentimes improper techniques can rip or tear this vital layer. When this occurs, moisture will begin to seep into your building instead of being routed away. Mold and rot can begin to take form, damaging the structural integrity of the structure as well as creating a major health hazard for its inhabitants. Moisture is the bane of any building’s interior, and proper insulation installation is necessary to avoid this headache. Any gaps in your insulation can also create a moisturized headache. When a gap is left during installation, moisture can begin to infiltrate, causing a myriad of problems, including causing your fiberglass insulation to fail at its tasks. Anticipating fire hazards and deftly avoiding them is one reason why you should hire experienced insulation contractors for your project. It’s vital to place insulation in a way that covers your ceilings and walls effectively without being in too close of proximity of hot elements such as lighting or your water heater. Recessed lighting, in particular, can create an unsafe level of heat for your flammable insulation. Blown-in insulation also creates a unique risk, as the material tends to drift, settling into risky areas that you may not even be aware of. Today’s fiberglass aims to do more than simply retain heat. More and more, products are coming with the ability to control the pests that lurk within your walls. When installed incorrectly, insulation can actually fail to prevent pest infestations, providing alleys and access points for pesky critters to enter. When it comes to proper insulation installation services, AZ Drywall Finishing is here to help! While we specialize in drywall installation and finishing, our insulation contractors help Chicago businesses to avoid the extreme temperatures while also avoiding costly headaches. Next time, we’ll look at a few more dangers that you can expect when working with one of the many inexperienced insulation companies in Illinois. If you are in need of the best commercial insulation services in the industry, be sure to contact us before starting your project!